Consumers walking down the aisles of a grocery store often face brightly colored packaging, wafting scents, and tough choices. By simply picking up a food item, shoppers are asking themselves several questions at once: Is the nutrition worth the price? How much do I value nutrition pitted against other factors such as ease of preparation or cost? Do I trust the labels on the packaging? 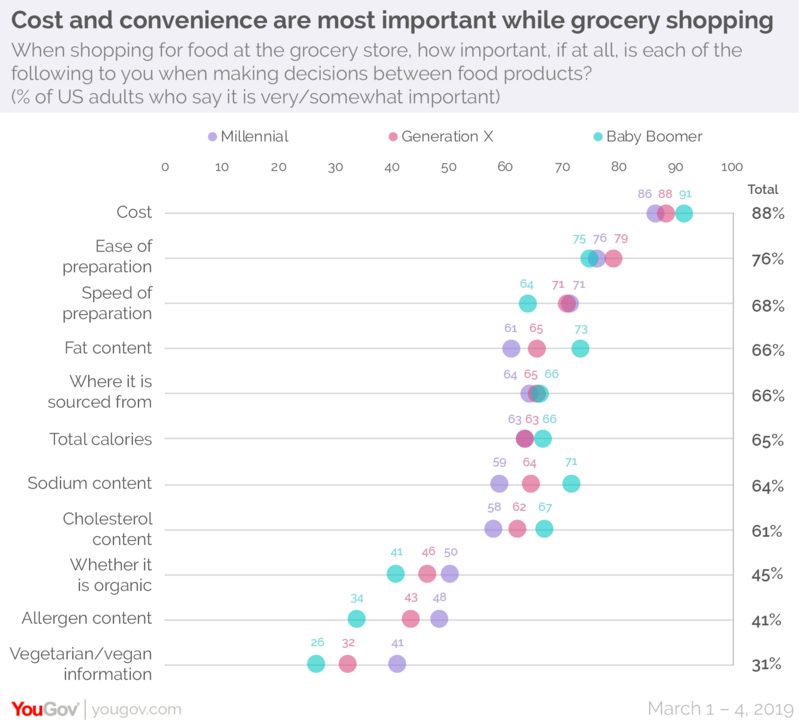 A recent study from YouGov Omnibus finds that in terms of importance, Americans place nutritional considerations behind factors such as cost and convenience while shopping for groceries. The study asks consumers how important certain factors are when deciding between food products, and a majority (88%) say cost is important. The two factors that follow cost in this measure of importance are ease (76%) and speed (68%) of preparation. Two in three (66%) Americans consider fat content and where foods are sourced from equally important. Following this, at least six in ten rate nutritional information such as total calories (65%), sodium content (64%), and cholesterol content (61%) as important. There are a few factors that less than half of Americans consider important in their decision-making process: whether a food item is organic (45%), allergen information (41%), and vegetarian/vegan information (31%). 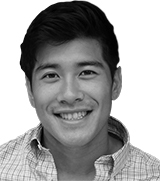 Age also appears to play a role in grocery shopping considerations . Millennials, for example, are more likely than boomers to view information on whether a food is organic (50% of millennials vs. 46% of baby boomers), contains allergens (48% vs. 34%), and is vegetarian/vegan (41% vs. 26%) as important. Boomers, on the other hand, are more likely than millennials to consider information regarding fat (73% of baby boomers vs. 61% of millennials), sodium (71% vs. 59%), and cholesterol (67% vs. 58%) important. And parents of children under the age of 18 are more likely than non-parents to consider factors such as speed of preparation (74% of parents vs. 66% of non-parents), whether a food item is organic (51% vs. 42%), allergen content (51% vs. 38%), and vegetarian/vegan information (38% vs. 29%) as important. Which food packaging labels do people trust? Today, statements found on food packaging such as “High in Fiber”, “Lightly Sweetened”, and “Reduced Fat” can serve both as a source of dietary information and a form of advertising. Given the latter, Americans are likely to place their trust in certain labels more than others. Labels denoting composition such as “High in/Good Source of” (69%) as in “Good Source of Protein” or “Made with” (66%) as in “Made with Real Fruit”, earn the most trust from consumers. At least six in ten also trust labels containing the words “Fresh” (65%), “Low” (64%) as in “Low Sodium”, “Lean (61%), and “-Free” (60%) as in “Gluten-Free”. Two labels, in particular, stand out for the confusion they cause. 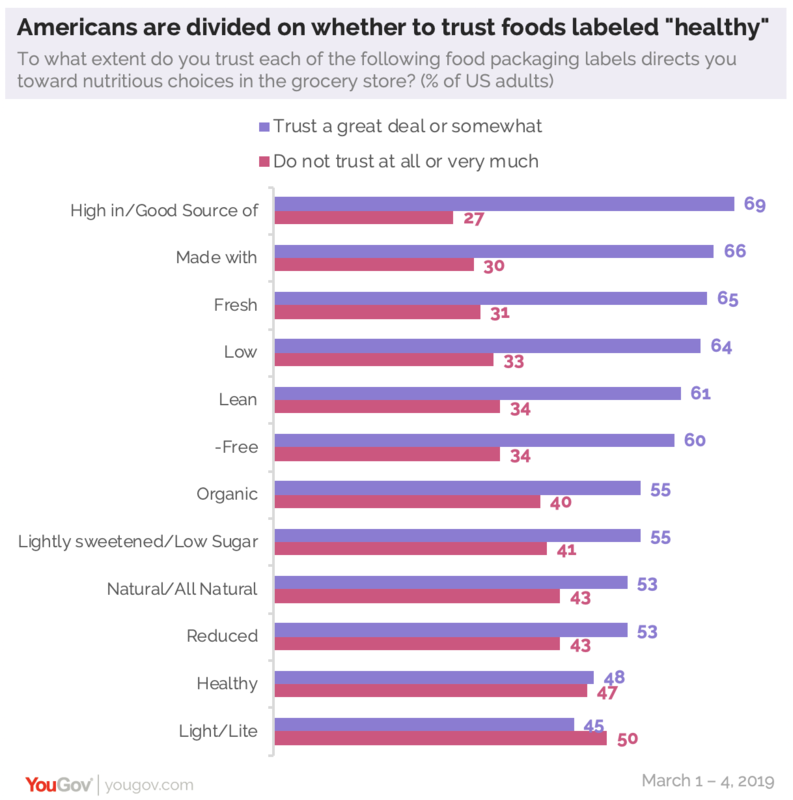 Americans seem divided on whether to trust labels that include the words “Healthy” (48% trust vs. 47% do not trust) and “Light/Lite” (45% trust vs. 50% distrust). Millennials are more likely than baby boomers to trust labels with the words “Natural” (58% of millennials vs. 50% of baby boomers), “-Free” (64% vs. 55%), “Organic” (61% vs. 50%), and “Light/Lite” (50% vs. 39%). And parents of children under the age of 18 are also more likely than non-parents to say they trust those same labels: “Natural” (60% of parents vs. 51% of non-parents), “-Free” (67% vs. 58%), and “Organic “ (61% vs. 53%).